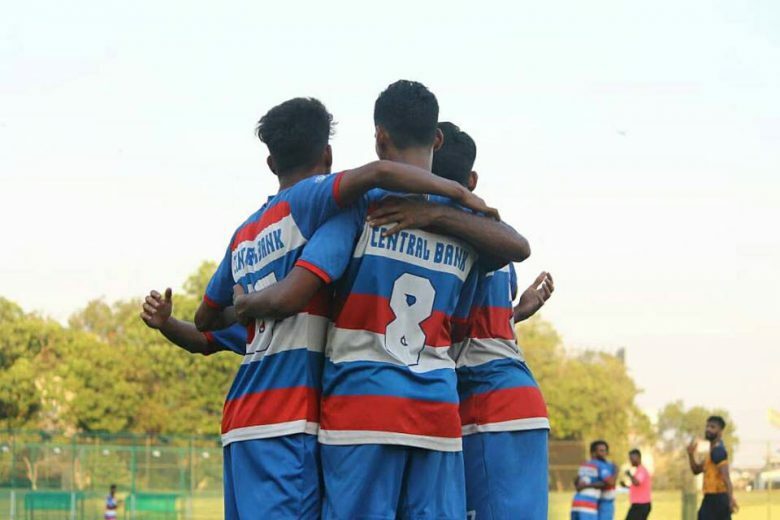 19th March 2019, Mumbai: On Tuesday, Central Bank of India (CBI) faced Central Railway while FSI Seaview locked horns against Mumbai Strikers in the MDFA Elite Division at the Neville D’Souza Ground, Bandra. CBI took advantage of the extra man and registered a 5-3 victory against Central Railway, whereas, FSI Seaview narrowly overcame Mumbai Strikers 2-1. The Bankers displayed a commendable performance as they left no stones unturned against an experience Central Railway side. It only took CBI two minutes to break the deadlock when Akshay Saptoji found the back of the net with a neat finish. But just ten minutes later, Ajinkya Nalavade leveled the score for the Railways. Both the sides were on equal terms until Railways’ forward Shahbaz Pathan received a red-card which eventually turned the game around. CBI swiftly took advantage of an extra man and piled huge pressure on Railways’ backline. In the second-half, Shubham Pose restored CBI’s lead before Russel chipped in another goal to increase the lead by two goals. Central Railway’s hope was restored in the 74th minute when Sumesh Nair converted from the spot to cut short the deficit. But two more goals in the space of two minutes from Shubham and Russel took the game beyond Railway’s reach. Though Rashid Shaikh scored in the injury time, the match had already been sealed by the Bankers. In the other game, Mumbai Strikers suffered another loss after going down 2-1 at the hands of FSI Seaview. After end-to-end stuff, it was FSI who broke the deadlock in the additional time of first-half. Nehal Shetty got on the scoresheet after beautifully placing his effort into the back of the net. In the second-half, Ninad doubled the lead from the spot to add more misery on Mumbai Strikers. The Strikers pushed forward and only managed to get on the scoresheet in the last minute of the game. Referee Susheel Kumar pointed towards the spot as Mumbai Strikers got an opportunity to pull a goal back. Rakesh Patne stepped up and converted his effort into the goal but it was too late as FSI held their nerves to claim all three points.